My childhood church maintains numerous familiar faces, 3 decades older than when I last attended there. The traditions, hymns and casual interactions among those we’ve known for many years bring unexpected comfort in knowing that “home” still has so many fulfilling memories. As I am home for the holidays, I witness so many changes. Grandparents who died long ago, yet their spirits feel present, smiling at our family holiday traditions. The only street where I grew up … once filled with friends and homes is just houses now. The nearby parks/wooded areas long for kids to find adventure in them once more, bringing back their former fascination. In this year’s “home for the holidays,” I had an absolutely wonderful time connecting with so much family. We had a wonderful time sharing, looking after each other and reminiscing of yesteryear. And it dawns on me that these contrasts in “going home” are like the memories I enjoy of the “me” I knew until 10 years ago. A lifetime before encephalitis—a brain disorder that robs so much from its survivor. “Home” is where everything is familiar without the guessing games of black-and-white thinking. Home is the ability to remember things without assistance or the nagging, “don’t you remember? !” Home is independence without boundaries or limitations. And as I reflect on “going home” and these funny scenarios that occur daily, I laugh and realize that “home” is like moving from one house to another. This new “home” is more challenging, makes me meet my health deductible in January every year and often frustrates me over all the residuals that plague me. But it’s a choice … change is inevitable. Going home, I actually like the new Becky better. She’s more compassionate, sets boundaries to not overdo it and more spiritually based than her predecessor who moved out. Welcome home. 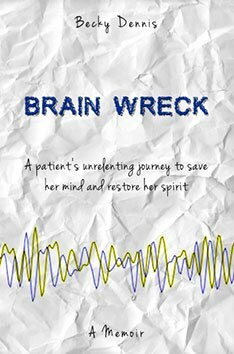 Becky Dennis is the author of one of Amazon’s top-rated books, “Brain Wreck.” She is also the president of the board of Encephalitis411.org, a new nonprofit focused on research, advocacy and awareness of encephalitis in the United States. She’s also a principal consultant in the marketing and sales company, Concept to Contract. Becky, thank you so much for sharing your story and your residuals. They are invisible! I often get asked, “Why did you do that?”. My only answer is “I don’t know.”. They don’t understand “It’s a residual.”. I don’t think the neurologists who have saved our lives understand what they are either and just tell us we should be happy to still be alive.